When I go home, friends or family who know anything about me or who follow me on Facebook usually ask me first, “How is Paris?” and then, invariably, “How are the cupcakes?” I’m not a professional cupcake baker by any means. I enjoy eating the occasional cupcake, baking them for parties, and having a leftover one out of the fridge for breakfast with coffee (so good chilled). But I’m no connoisseur. So you’re probably asking, “What’s CupcakeCamp Paris all about then?” Well, when Cat Beurnier approached me to organize it in 2010, it seemed like a fun worthwhile cause. The idea was basically to hold a giant bake sale, have Parisians and expats donate cupcakes, and then sell them for charity. Simple enough, right? Cupcakes were trendy, so people were eager to talk about them. And the idea of doing something for charity seemed like a great change from all of the school files and prefecture paperwork I was going through at the time. We are delighted and extremely motivated by all of the work that Make a Wish does, so each year we are trying to raise even more money to help make the dreams of sick children come true. Every cupcake helps! 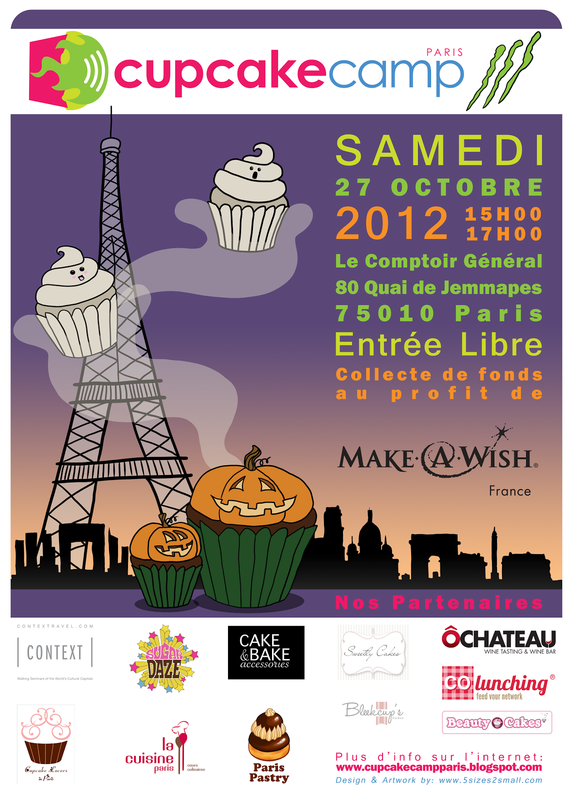 But Cupcake Camp in Paris has also been a great way to create a sense of community between many Parisians and expats. It’s encouraging to see the same generous sponsors and eager faces showing up with cupcakes and to be in a venue surrounded by French people who are smiling. Swim in a sea of cupcakes and I dare even the staunchest Parisian not to crack a grin. That may sound sappy, but live in a city where your own neighbors don’t know your name after four years and you start to value to the little interactions that make you feel like a human being. When I walk by Pink Flamingo pizzeria and the pizzaiolo in the kitchen waves to me, when the baker at my boulangerie says, “Hi Bryan!,” and when the barber stopped asking me if I was on vacation after a year – these are small yet highly-valued comforts. With a family an ocean a way and friends tucked between the skyscrapers of New York, being part of Cupcake Camp Paris has also been the most rewarding way to invest my time in this city with only positive results for everyone involved (diabetics aside). So we’re rallying around our cause again this year, happily donating every single centime to Make a Wish here in France so that they can continue to do the beautiful work that they do. We’re hoping to feature over 2000 cupcakes for the third edition, and we are campaigning endlessly so that locals across Paris and the near regions will bring a few dozen of their own creations to share. If you know anyone who may be interested in baking, donating a prize, some time, or anyone who can attend, spread the word! I’ll be at the front table selling the tickets, so make sure you say hi! oh but i don't know, Modest... i've had a lot of cupcakes and yours are the best hands-down. better than butter lane, even, although those are currently more accessible.